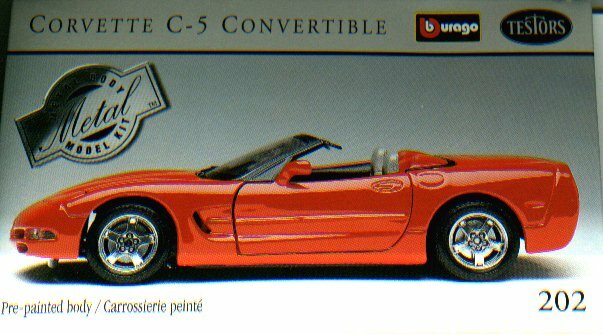 The 1999 "C5" Corvette convertible shows a sharp evolution in the body style introduced in 1983. With a new engine under the hood, it's the current flagship (and priced as such) in Chevrolet's lineup. It does go together very easily - the instructions are pretty straightforward (though bending some of the parts to form the proper profiles, mostly in the engine and radiator/chassis, is different from many of these kits.) Fit, other than the loose overlay/windshield frame, goes well. The only other problem area is in the turn signals - try as I might, I could not get them to go all the way in. Detail's typical for these kits - not as 'crisp' as a plastic kit, but acceptable (and probably true to scale!) Add to that the durability and lack of a need to paint the kit, and you have a nice diversion and a reason to spend more time with the kids. All in all, detail's acceptable, and this builds into a nice little representation of the Corvette.